If you thought things couldn’t get any worse for Evelyn Lozada and Chad Johnson….think again because the newlyweds’ new reality show is being scrapped! VH1 has announced it has decided to cancel Lozada and Johnson’s upcoming new reality show following this weekend’s domestic violence incident in which Johnson was arrested for allegedly head-butting Lozada, TMZ reported Monday. “Ev and Ocho” – a spinoff of VH1’s Basketball Wives reality series -was to chronicle the events leading up to the recent marriage of Lozada, who previously co-starred on Basketball Wives, and Johnson, an NFL football player who has previously appeared on several reality series. 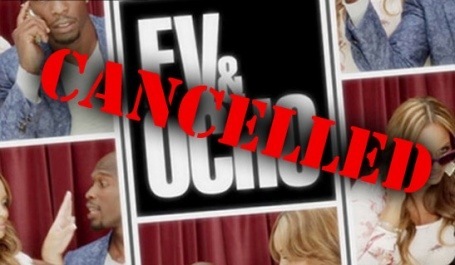 Ev and Ocho had been scheduled to premiere Monday, September 3 on VH1. The domestic violence incident allegedly occurred after Lozada found a receipt for condoms and confronted Johnson about it outside the couple’s Florida home on Saturday night. Johnson was subsequently arrested and charged with simple domestic battery. He was released from jail on $2,500 bond on Sunday. It gets worse…..earlier today the Miami Dolphins — whose NFL training camp is also being chronicled on the current season of HBO’s Hard Knocks reality series — also released Johnson. Lozada and Johnson — who recently legally changed his name back from Chad Ochocinco — began dating while Johnson’s Ochocinco: The Ultimate Catch reality dating show was still airing on VH1 in 2010, spoiling the fact that he hadn’t found lasting love on the show. The couple got engaged about a year later in November 2011. This entry was posted in Athletes, Celebs, Reality TV and tagged cancelled, Ev and Ocho, Reality Series, vh1. Bookmark the permalink.